City Properties Real Estate won the Sharjah Economic Excellence Aword This came during a ceremony honoring the winners of the Sharjah Economic Excellence Award 2009 held on Wednesday (May 26, 2010) at the main building of the Sharjah Chamber of Commerce and Industry where City Properties Real Estate was Awarded the Small and Medium Enterprises-Commercial Category. 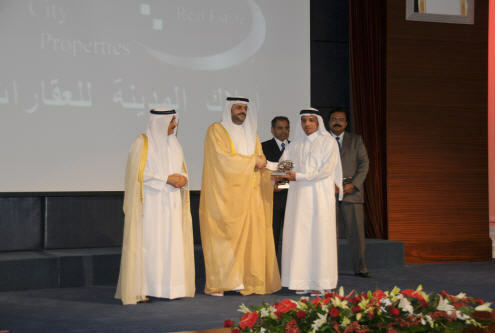 The Winners of the 2009 Sharjah Economic Excellence Award (SEEA) were honored in the presence of H.H. Sheikh Sultan Bin Mohammed Bin Sultan Al Qassimi, Crown Prince and Deputy Ruler of Sharjah, who attended this special ceremony to honor the winners of Sharjah Economic Excellence Award for 2009. The ceremony was held at the Sharjah Chamber of Commerce and Industry (SCCI) headquarters and was attended by his Excellency, the presidents and members of Sharjah Consultative Council; Chairman of Dubai Chamber of Commerce and Industry; the SCCI Chairman and members; and senior managers of companies and institutions from various fields.